When I first began traveling to Big Bend in the late 1980s, my introduction to lodging—other than a tent in the Chihuahuan Desert—was a room at the Gage Hotel in Marathon. Quiet, rustic, and largely undiscovered back then, the yellow-brick hotel stood as an outpost of civilization on the edge of Big Bend National Park’s vast wildness. The Gage Hotel is at 102 N.W. 1st St. (US 90 West) in Marathon. Call 432/386-4205. The Holland Hotel is at 209 W. Holland Ave. in Alpine. Call 432/837-2800. The Hotel Paisano is at 207 N. Highland Ave. in Marfa. Call 432/729-3669. The Hotel Limpia is at 100 State St. in Fort Davis. Call 432/426-3237. The vintage hotel offered a chance to sleep in a comfortable bed and take a hot shower before I headed to the national park for a week of backpacking with friends. I rocked in the chairs on the front porch, gazed at the blue mesas where the ribbon of highway disappeared, and felt like I had found nirvana. I vowed to return to the Gage and get to know Marathon better. Return I did with my husband, Dan, year after year. Marathon and the Gage became our standard first stop on our travels around the region. Over time, we discovered other historic lodgings and watched them take shape into worthy destinations in their own right, particularly the Holland Hotel in Alpine, The Hotel Paisano in Marfa, and Hotel Limpia in Fort Davis. To find these four preserved and fashionably updated hotels in such a remote region continues to delight and surprise us. Each hotel looks and feels different, reflecting its hometown’s individual ambiance. And now there’s another attraction for foodies like us—on-site restaurants employing chefs who put a fresh regional spin on their menus with locally sourced ingredients. The Gage no longer functions simply as our overnight station on the way to somewhere else. 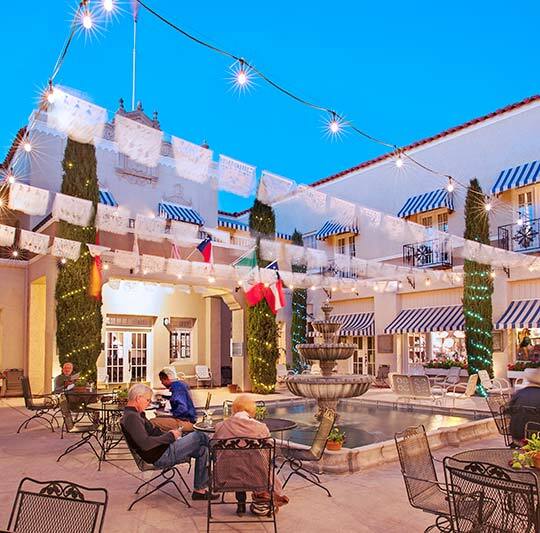 Ideally, we like to stay a few days, explore Marathon’s art galleries down the main street (US 90), sample a fried pie at Burnt Biscuit Bakery, swim in the Gage’s heated pool, and enjoy a good meal and a glass of wine. Alfred S. Gage, a West Texas cattle baron and San Antonio banker, built the Gage in 1927, wanting a comfortable place to stay while tending to his regional ranching interests. He hired the prolific El Paso architect Henry Charles Trost, who would also design the Paisano, the Holland, Hotel El Capitan in Van Horn, and dozens of El Paso buildings, including the 1912 Camino Real Hotel. The Mission-style Gage sparkled as the town’s social center where locals dined, danced, and cut business deals. By the 1970s, though, the once-grand Gage had been remodeled so many times that its linoleum floors cracked and layers of paint had built up on the woodwork. In 1978, Houston businessman J.P. Bryan and his wife, Mary Jon, who own the sprawling Chalk Draw Ranch on the edge of the national park, bought the hotel for a mere $30,000. Bryan tracked down the Gage’s original plans and embarked on a restoration project. The Gage includes the original hotel and its 15 restored rooms, which feature refined Western furnishings; Los Portales—our favorite spot—20 adobe-brick rooms added in 1992 that open to long covered porches arranged around a landscaped interior courtyard; three stand-alone casitas; and Captain Shepard’s House. Built in 1890 by town founder Capt. Albion Shepard, the two-story, Colonial-style home features five bedrooms and a two-room carriage house. Along with the 27 acres of native landscaped gardens, and plans for a new Visions of the West Museum scheduled to open in 2016, the Gage also offers a fabulous setting to unwind with dinner and drinks. We peruse the menu at 12 Gage, headed by chef Brandon Waddell, and start with Texas quail with a blue cheese, almond, and cherry stuffing, port wine reduction, and sweet corn fritter. Entrées such as beef tenderloin and honey Dijon-marinated white rabbit tempt, too, but the tenderloin of hazelnut-crusted elk with a pinot noir reduction and parsnip maple purée reigns as the must-have dish for carnivores, in my opinion. 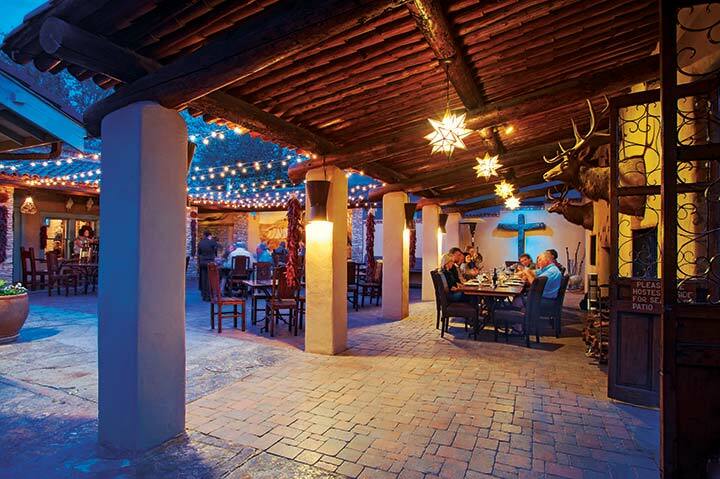 After dinner, we cross the courtyard to the White Buffalo Bar—named for the head of a white buffalo mounted on a wall—with its leather seats and viga-post ceiling. The bartenders pour Texas tequila and wines, beer, cocktails, and such signature drinks as the Texas Martini with Tito’s vodka, jalapeño, and olive juice. 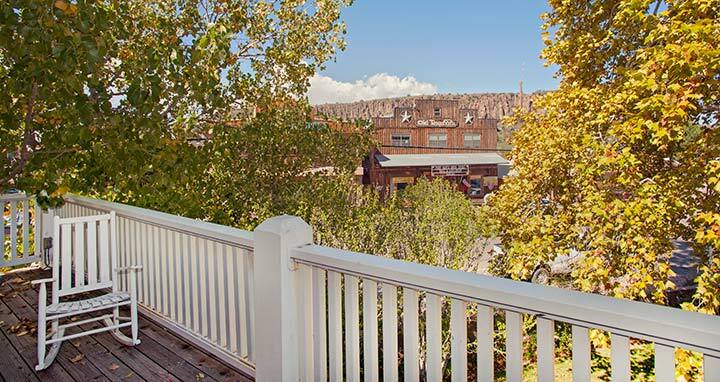 We find this same strong sense of place when we arrive at the Holland Hotel in downtown Alpine, about 30 miles west of Marathon. Another Trost architectural masterpiece, the Holland was built in 1928, one year after the Gage. Trost wanted his hotels to blend into the landscape and called the desert buildings his “Arid America” style. The Holland certainly looks like it belongs in Alpine with its Western flavor—arched doorways, wooden beam ceilings, stucco walls, and stone fireplaces. A 2011 restoration of the Holland’s 24 guest rooms stayed true to the theme, as represented by the rooms’ warm colors, custom bedding, and paintings of West Texas scenery. 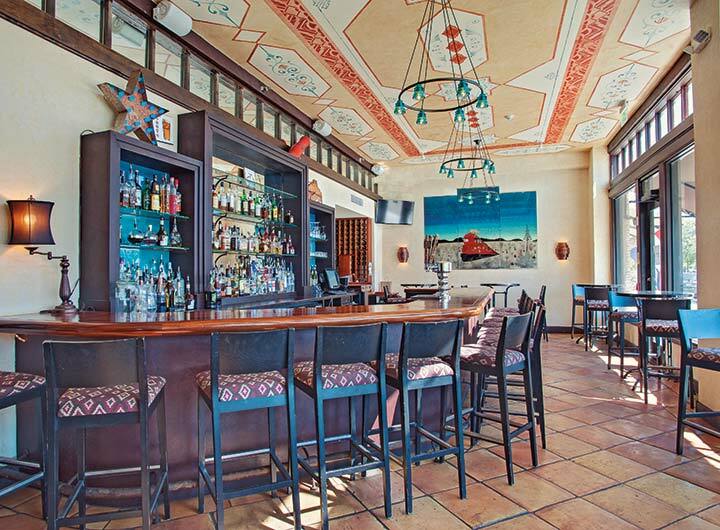 The restored Century Bar and Grill features an airy and intimate space in the main dining area, the Rio Grande Room, with a tile floor and wrought-iron chandelier. The bar, its ceiling painted colorfully with Western patterns, features broad windows looking out over the action on Holland Avenue and the railroad tracks. When the weather is mild, the hacienda-style courtyard beckons with potted cacti and a burbling fountain. The menu ranges from salads—go for the eight-ounce rib-eye steak salad garnished with Texas goat cheese and dressed in a tangy, roasted red onion vinaigrette—to entrées like burgers, beef tenderloin, and pan-seared rainbow trout. In late 2014, the restaurant hired a new executive chef, Amaury Torres from Santa Fe; we look forward to returning and sampling his cuisine. Another Trost-designed hotel awaited us in Marfa, home to the Big Bend’s most dynamic art scene, one of the world’s largest art installations at the sprawling Chinati Foundation, and the ever-mysterious Marfa Lights. Designed in Spanish Revival style, El Paisano opened in 1930 and drew cattle ranchers buying and selling herds, as well as tourists seeking the dry desert air. Now called The Hotel Paisano, the hotel is renowned as the lodging for the roughly 150 cast and crew members who came to Marfa for the 1956 filming of the classic film Giant. Director George Stevens set up a projector in the hotel ballroom to watch the daily footage along with the stars, which included Elizabeth Taylor, Rock Hudson, and James Dean. which recall as much as possible the original fixtures. A Giant memorabilia room sells Dean T-shirts, copies of the Edna Ferber novel that inspired the film, and re-creations of original key tags with the actors’ names and room numbers. You can even sit down and watch the movie. The Giant theme continues at the restaurant, Jett’s Grill, where beef stars on the menu. Try the pistachio-fried sirloin with jalapeño gravy or the 12-ounce Black Angus burger, called the Giant. So do we all, and discovering an oasis of laid-back luxury in the midst of such wildness makes us appreciate it all the more. We sleep in these places steeped in history and wake up knowing that the adventure and mystery of this country lie just outside the door—and will draw us back again and again.